UNITE HERE and Hyatt Reach an Agreement! The agreement will go into effect upon the settlement and ratification of union contracts by Hyatt associates in San Francisco, Honolulu, Los Angeles, and Chicago. Pending associate approval, the contracts will provide retroactive wage increases and maintain quality health care and pension benefits. The proposed new contracts would cover associates into 2018.A key provision of the agreement establishes a fair process, which includes a mechanism for employees at a number of Hyatt hotels to vote on whether they wish to be represented by UNITE HERE. As part of the accord, upon ratification of the union contracts, UNITE HERE will end its global boycott of Hyatt. “We are delighted that our associates in Chicago, Los Angeles, San Francisco, and Waikiki will have contracts and the pay raises that go with them,” said Doug Patrick, Senior Vice President, Human Resources for Hyatt. I’m delighted for the workers of Hyatt and it has been my honor to stand with them during the course of this long and difficult struggle. One important takeaway for me is the importance and effectiveness of boycotts as an essential tool of the labor movement. In particular, I hope organizations will increasingly insist upon protective language in their hotel contracts so that they can honor boycotts without penalty. It is simply not enough to invoke the International Ladies Garment Workers Union and offer bland statements about the historic role Jews played in building the American labor movement. True solidarity means understanding that the struggle ever continues. And that there are flesh and blood “stakeholders” in our own day who call on us to support the sacred cause of worker justice. 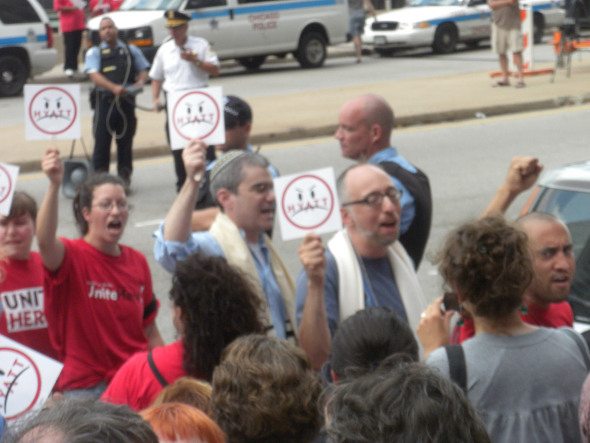 This entry was posted in American Jewish Community, Human Rights, Hyatt Boycott, Labor Justice, Unions on July 2, 2013 by Rabbi Brant Rosen. Great post Brant. I’m sure we’ll still need to keep an eye on Hyatt to ensure no backsliding! Sadly, many organizations I respect (including the American Library Association) have held conferences at Hyatt.